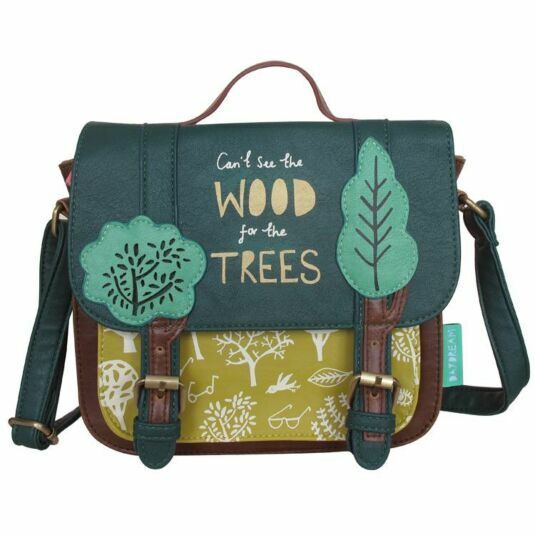 This quirky little satchel bag from the Daydream range by Disaster Designs will appeal to anyone who likes original designs and nature. 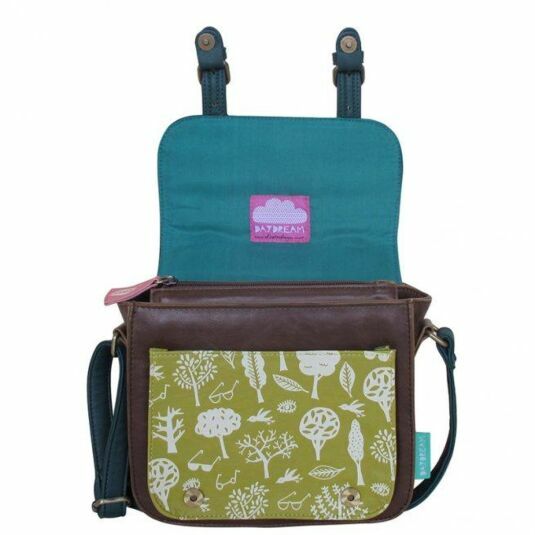 The sturdy bag is made from faux leather fabric and is brown and green in colour. The front flap has the phrase 'Can’t see the wood for the trees' written in white and gold decorative fonts. 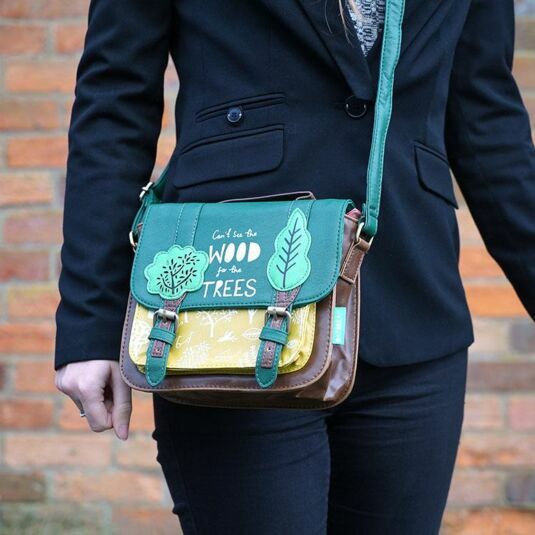 On either side of the text is a light green and brown appliqued faux leather trees, with the tree trunks running down onto both of the satchel style fasteners. Opening the front flap reveals a yellow toned pocket with cream doodles all over, perfect for keeping tickets and items that you need to get to quickly. The bag is then secured by a zip which has a pink faux leather pull. Inside the bag has one large open section which would fit a small wallet or purse, phone, keys and any other small essentials. There is also an additional zipped pocket to hold other small items such as a mirror, change, or lipstick. 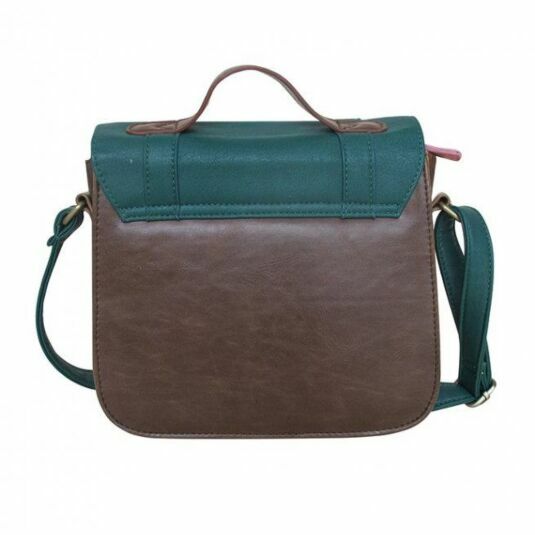 The satchel has a green adjustable strap for use on the shoulder or across the body. This high quality bag keeps its box shape even when not in use, despite being small this bag is perfect for everyday use, a trip to the shops, days out and walks in the woods. For everyone, from teenagers and best friends to mothers and grandmothers. The Daydream range from Disaster Designs is inspired by popular idioms. From ‘who let the cat out of the bag’ to ‘can’t see the wood for the trees’ . The range has a fun and playful feeling with hand-drawn doodles adorning each item. Perfect for the young, and the young at heart!